It is all over. About three months of preparation,bit by bit, little by little, advancing to the final day – all just for one day, or maybe two, of glorious celebration. I call it the one-day-kalyanam (wedding) tree. Its real name is unknown to me. If any of you can identify it, do please enlighten me. 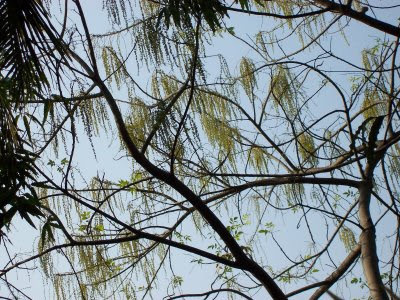 When it is in bloom, it looks like a pale golden haze from afar – the effect of leafless branches bearing the blossoms. I noticed it first in 2006. 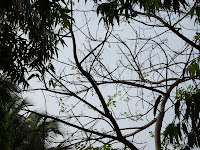 A few years ago in one of its environment conscious moods, the city corporation had planted a seedling on the pavement outside our compound wall, (as well as other places on the street) which grew little by little, and became large enough to block the view from our first floor balcony, with its green leaves. I was happy to see it grow, but was amazed one March to find that I could see right across the street. Where had the leaves gone? I worried that the tree might have started dying. But no, there appeared little dangling vines, bearing tight yellow buds, and waving in the breeze like streamers. I waited and watched, and watched, till one fine day in May it burst out in all its golden glory. I had almost missed the great blossoming. For about a couple of days the blossoms hung on the delicate vines, before falling on the ground and covering it with a fine gold dust. And then back to square one. The new leaves grew in a week, and I had to wait another year to see this glorious tree flowering. 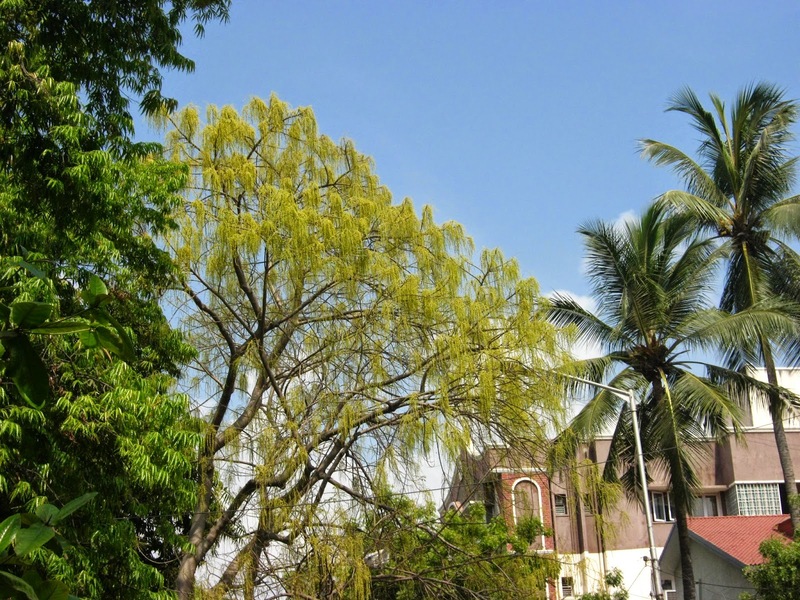 This year I decided to record its blossoming, but I found that other trees inside our compound had decided to grow higher – the coconut palm had after 10 years suddenly decided to grow (that is another story), and so had the Asoka trees. Still I looked for the suitable gap between these and managed a few pictures. After 5 years, I managed to catch the tree in full bloom today, (April 24, 2014). Do click on the other pictures for an enlarged view. One of the hottest days of summer today. 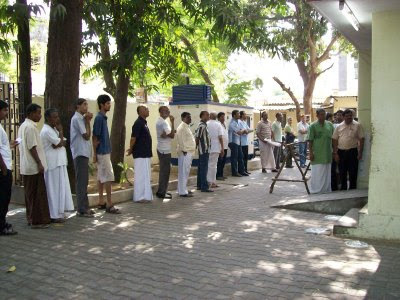 I am glad we opted to go early to cast our votes for the Lok Sabha (General Parliamentary) election - before the sun got too strong, and the booths too crowded. My husband and I along with Maiji went to the Corporation School, our designated booth. The whole procedure, smooth and quick, took less than twenty minutes, out of which it took me ten minutes just to look at all the candidates’ names to find my chosen one from the three Electronic Voting Machines - we had 44 candidates to choose from. But the way the campaigns reached us, we did not know of any of the less prominent or independent candidates. Such parties which have their own TV channels could use their air time to telecast the road and public campaigns of their candidates. 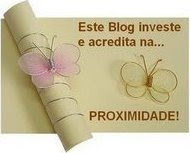 But others who used their own money, and did not have their own TV channels, had to perforce maintain a less aggressive profile comparatively. It is a given that it will be one of the Dravida parties that will win in Tamilnadu, along with their ‘allies’, a kind of cooperative which lasts only as long as the elections last. We will know in a few days if the candidate we voted for (all three of us voted for different people) wins. *That should be BEL for BHARAT ELECTRONICS LTD, as pointed out by Swarna. Thanks, Swarna. Every year on May 5, without fail the Devan Endowments celebrates Devan’s anniversary, with Charukesi the Managing Trustee at the helm. More about this here. Devan was a leading humorist of the 1940s and 50s, and is still warmly remembered by readers and writers of Thamizh. His homespun humour and ready wit endeared him to generations of readers. In the cool ambience of the air-conditioned Smt. Sivagami Pethachi auditorium, once again Charukesi honoured two members in the world of humour – cartoonists Keshav of The Hindu and Mathi of Dinamani. 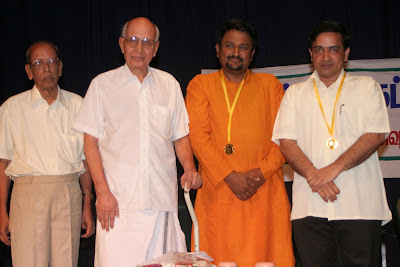 Legend Gopulu, illustrator and cartoonist par excellence, presented the awards. That ‘Brevity is the soul of wit’ was proved that evening in the speeches that Gopulu, Keshav and Mathi made. It made me think that they are artists not only of the brush, but of the word, too. Mathi spoke about the timelessness of Gopulu’s cartoons, which his nine year old son could enjoy even today. 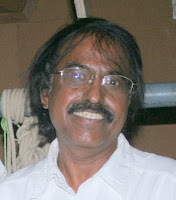 Gopulu complimented Charukesi on his ability to don several avatars – writing humorous short stories, music reviews, and organising occasions like this. “He is a ‘theneey’”, said Gopulu. A most suitable epithet, for Charukesi is indeed as busy as a bee with his various activities. Though we had to leave before the end of the play, I am sure those who did also got home before their favourite serial started. Two plays in a week! That was a real treat. When Augusto, friend, playwright and oculist, invited us to his latest, it was within a week of our seeing KB’s ‘Pournami’. You would think that the enervating heat would bring to a halt all non-essential activites especially on the entertainment front. But, happily, it is not so. Chennai residents know what is in store for them weather-wise, and take it in their stride. For a few years now, Karthik Fine Arts has been doing a great service to theatre by promoting the staging of new plays and holding a contest for them, calling it the Summer Play Festival. Dramatists find it a good launching pad to present their latest, and also win a few prizes in the bargain. Augusto is a regular here, and has almost always won prizes. And so we went to see ‘Mukham, Mukavarigal’, written and directed by him, on the last day of the festival. It had an unusual storyline (the opening scene immediately caught the interest of the audience) about a rich misogynist who grew up in a ‘home’ (euphemism for orphanage). His philanthropic nature does not extend to women, and the denouement tells us the reason for this. The suspense is well-maintained, and the viewer’s attitude to the misogynist turns from aversion to sympathy – good work by the director. 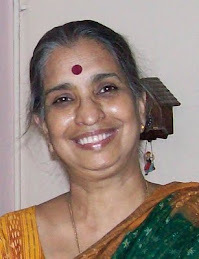 The acting was uniformly good – all Augusto’s regular cast, except the sole female actor, Sujatha. The dialogue was crisp, and happily, there were no enforced humorous interpolations. 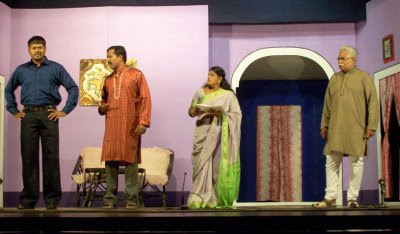 The ten minute soliloquy by K. Raja, (the protagonist) was well presented and acted. I did not hold with the ending of letting the rich man be killed, and later told the playwright my view, who explained just why it had to end so. Could the last scene have been trimmed a bit? The negative side of reality television shows caused by comments from harsh and insensitive judges has been woven neatly into the main story. I was impressed with the music by Guha Prasad also. Unobtrusive and melodious, it added greatly to the play’s charms. It is Augusto’s 29th play. “I used to write more in my early days,” he said. “But nowadays I write only one a year, having to attend to my other work as well.” Augusto’s Opticals is well-known in Mylapore. All told it was a good play. The only glitch was the air-conditioning in the hall of Narada Gana Sabha. Either it was not set to the right temperature, or it was malfunctioning. By the time we got up we felt acutely the lack of fresh air, and were drenched. ‘Summer festival living up to its name, I suppose.